In my opinion, this is the prime time of year to hike in the Mt Hood wilderness. The weather is typically warm and mild (with the exception of this weekend, where it is supposed to reach 100! ), and the wildflowers are amazing! I took my first short hike after injuring my foot a few weeks ago this past weekend, and was amazed at the beauty. I don't take many flower photos anymore. However, I could not pass up clicking this photo. 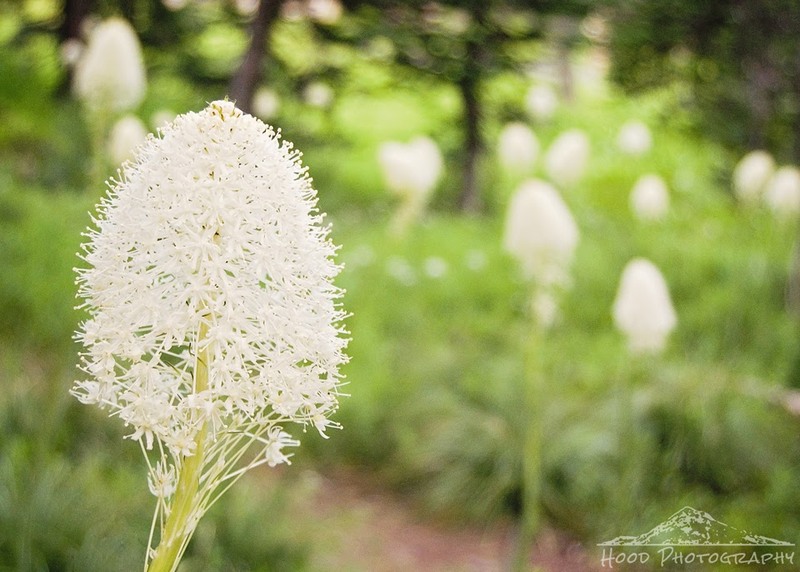 Arguably the most noticeable wildflower in its peak right now is beargrass. It truly seems like there is more flowers than usual. Perhaps our mild winter aided in more blooming this year? All I do know is that it was amazing to see the fields upon fields of blooms. Bear grass... that's a new one to me! All reports I've heard that this is an exceptional wildflower year in the Cascades. I'm sure the warm, dry weather had lots to do with this. Sigh.....I picked the wrong time to be laid up.. I have never seen this wildflower before. It is stunning. What an amazing flower! Have never seen it before!